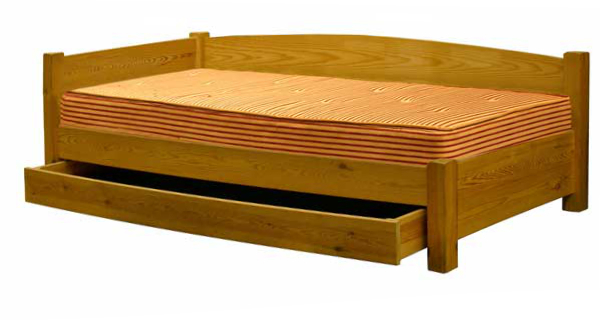 It can also be produced as a Type 2 stacking bed (see below), but with a back and arms and where the under bed replaces the drawer. This raises the seat height by approximately 3¼“ (8 cm), and costs an additional £75. PRICE INCLUDES THE FITTED DRAWER. 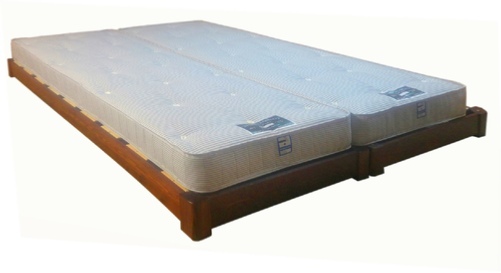 The Type 1 stacking bed has a concealed lower mattress and rounded corners. The upper bed stacks securely on removable dowels and is supplied fully constructed with mortise and tenon joints. Approximately 3¼“ (8 cm) longer and wider than the mattress. When un-stacked it serves as two separate beds rather than a double. For a stacker that converts into a double, see Type 3 Stacking Bed (below). As with all stacking beds, un-stacking requires two people. Available in clear varnish, coloured varnish or white painted. See finishes. See optional mattresses. The Type 2 stacking bed has a bolted, mortise and tenon construction. The upper bed stacks firmly on removable dowels set into the lower legs. It is approximately 4¼“ (11 cm) longer and wider than the mattress. When un-stacked it becomes two separate beds rather than a double. 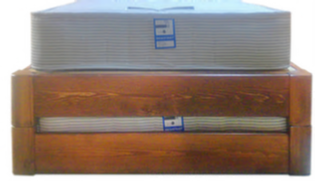 For a stacker that converts into a double, see Stacking bed - Type 3 (below) Un-stacking requires two people.. See optional mattresses. Our latest stacking bed converts into a double and the mattresses can be drawn together and zipped. The upper bed stacks firmly on removable dowels set into the lower legs. When stacked the bed is no higher than a standard bed. The lower bed is upturned when separated. It comes fully constructed with mortise and tenon joints for durability and is approximately 3¼“ (8 cm) longer and wider than the mattress. Un-stacking requires two people. More information can be found here. The lower bed pulls out on wheels. Metal legs then drop down. Unlike the Stacking beds this operation only requires one person. This is a very stable construction. The mattresses can be drawn or zipped together to make a roomy and comfortable double.